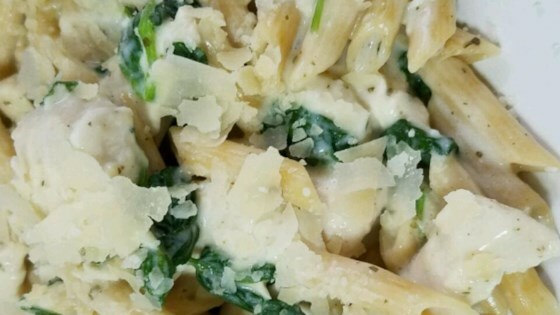 "Extremely rich combination of chicken, spinach and creamy pesto sauce. Serve with crunchy bread and romaine salad--it's the best!" Heat oil in a large skillet over medium high heat. Add garlic, saute for 1 minute; then add chicken and cook for 7 to 8 minutes on each side. When chicken is close to being cooked through (no longer pink inside), add spinach and saute all together for 3 to 4 minutes. Add chicken/spinach mixture to pasta, then stir in pesto/Alfredo sauce. Mix well, top with cheese and serve.